Things are moving now at such a pace it makes your head spin, and unfortunately also your head hurt, but more on that later. 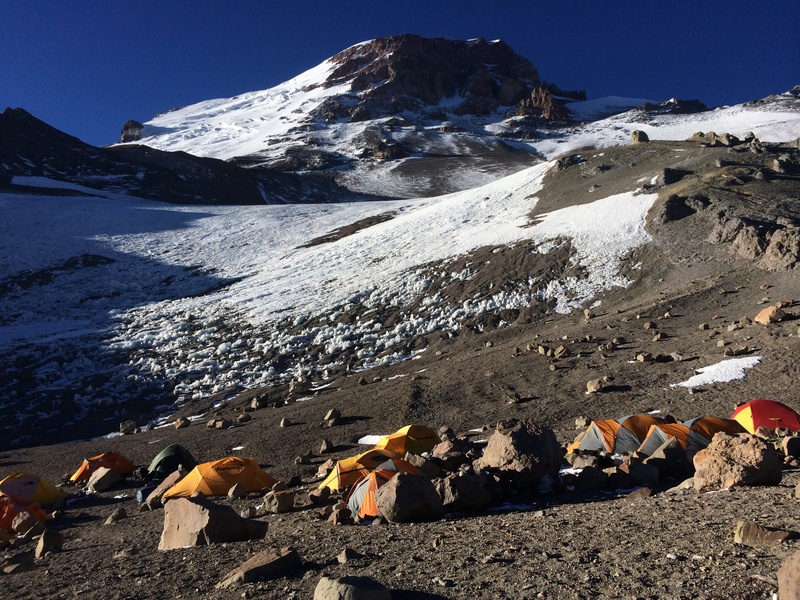 This morning we woke up up to a beautiful cloudless sky at Camp 2, 5,500m (17,800ft). It was the highest elevation I had ever slept at, and I slept surprisingly well. There were probably 20 times that I woke up and tossed and turned, checked the temperature (-11 the lowest I saw, but that was inside the tent), and took a sip from my semi-frozen (despite insulated bottle holder) water, but I by and large got back to sleep right away. Good news :). It had also been a fairly calm night, although the tents were held down with boulders that would have stopped an elephant in its tracks. Final morning at Camp 2….not a bad sky! Time to untie these boulders from the tent then. Today was move day for the second time in a row, following yesterday’s news that we’d try to summit tomorrow (4th Jan). This meant we had to get another 2,000 feet up the mountain in order to be at the final camp to have any chance of making it. We began therefore to unpack tents and carry everything that we’d brought with us, probably upwards of 20kg. The guides however had decided to carry everything else, including tents and group gear, to help us out. Otherwise, we simply couldn’t have got up the mountain in one shift. Peter’s backpack apparently weighed 75lbs (29kg), and I learned afterwards that Tincho and Johnny both carried 38kg (84lbs) – quite astonishing at this altitude. 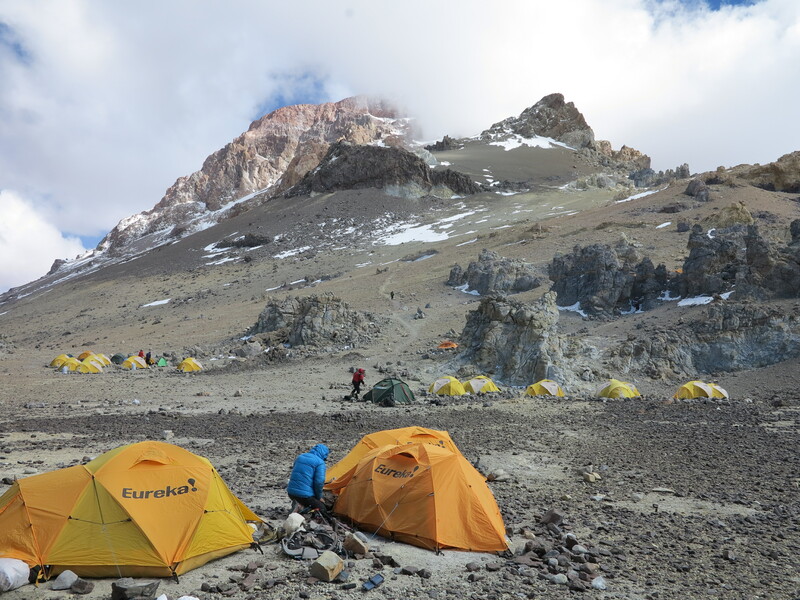 Following our packing, Johnny and Tincho went ahead to set up tents for us at High Camp, and we began with Peter our own journey up the mountain. We’d head up to around 6,000m (19,800 feet), and this would therefore be our last (and hardest) carry. The climb out of Camp 2 is also almost unmercilessly steep, steep enough in parts where if you fell you’d be hurting yourself. With the added weight on your back, combined with the lack of oxygen, it made it a massive effort. I thought back to the 20% hill back in Woburn that I used so many times to train on, and thought how ridiculously easy it seemed now. I imagined myself running up there and laughing maniacally when I got home. We took about three stops on the way up, the gradient lessening, but still very hard work the whole way. The weather was cold enough by now for two pairs of gloves, long johns, Goretex top and bottom etc. At the final stop, Peter took the time to explain to us a few things that we’d need to take, and not take, for summit day, and what else to expect. The summit push was probably less than 24 hours away now. It brought everything home, and I began to believe properly that I might just be standing on the top of Aconcagua the very next day. It was a very emotional moment, but I tried not to lose focus. We rolled into High Camp at about 2.30pm, around 5 hours after leaving Camp 2. Perched at the foot of the final ascent (a mere 980m!) to the summit itself, Camp Cholera is as you would expect the bleakest of places. Brutally cold, incredibly windswept, and just a rocky platform enabling a few crazy people to pitch a tent to enable them to hopefully realise their goal of getting up to one of the Seven Summits. Otherwise I cannot imagine anyone, ever, wanting to, or having been here. 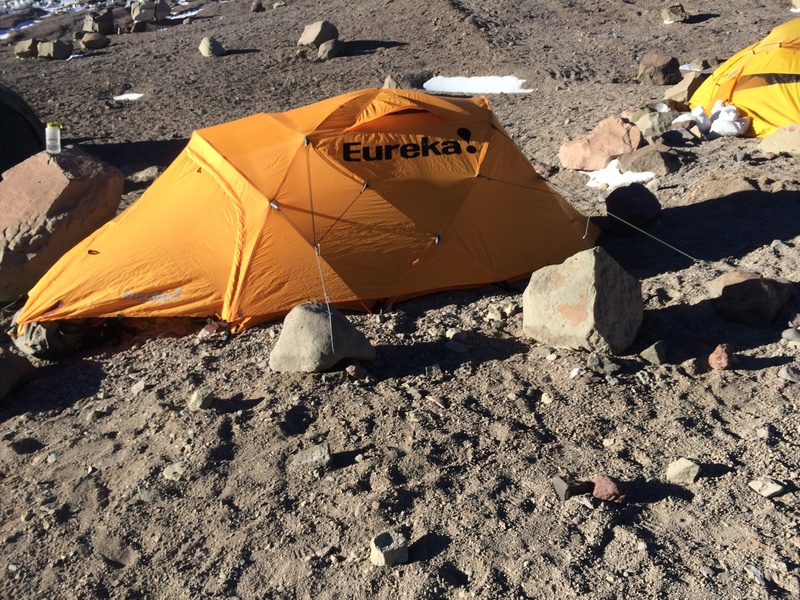 Camp Cholera, 6,000m (19,800 feet) – the summit is five hours and 2,000 vertical feet closer and yet somehow continues to look further away! We did as suggested by the guides and buried ourselves in our tents right away. It would have been too cold to do anything than get inside your sleeping bag anyway. It took a bit of a while to get water to us, as the only way of getting it was to boil snow, and as anyone with a rudimentary knowledge of chemistry will tell you, boiling takes much longer at altitude. I think it took two hours to get sufficient water to supply everyone, and by then I unfortunately had a headache. I’m not blaming the former on the latter, they are just facts that’s all. I wolfed down as much as I could before dinner (about 5.30pm), and began to think about getting things I needed for the following morning, which would start at about 5am. We’d carry very little – crampons, ice axe, enough food for 10 breaks, water (two litres), and that’s about it. We’d be wearing everything else – four layers on the legs (long johns, climbing trousers, Goretex, and then salopettes), and five on top (thermal base layer, fleece, light Pertex or down jacket, Goretex shell, and then big down jacket). The forecast for the day was still good, clear skies, 25kph winds, and -32C. An almost perfect scenario I was told. My headache started however to get worse, and sadly my dinner of mashed potatoes was unpalatable to say the least. I did eat probably half, but it made me feel a bit nauseous. I began to worry if I was going to get AMS, but tried to put all thoughts out of my mind. These things are ‘normal’ after all at this sort of altitude. I was also so close now, so tantalisingly close. If I’m brutally honest with myself part of me thought I wouldn’t get this far, to be sleeping at 19,800 feet with one slog to go. I had to simply banish all these thoughts and get through the night, sleep, look after myself and be strong. Easy to say of course, and so much (almost cryingly) harder in the here and now.